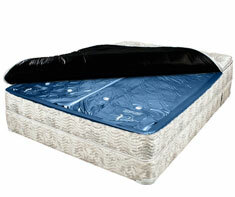 A Water Bed is a type of sleeping bed where the mattress is filled with water. A water bed typically consists of a vinyl mattress that is filled with water, and rests inside a wooden frame which supports the bottom and sides. A safety liner is in place to catch water in event of a leak. Some models of Water Beds have baffles to help minimize the water from sloshing around. And some models have electric heaters to to keep the water bed at a comfortable temperature. Shown in the 'Routine Care' section are the recommended routine maintenance tasks for your water beds. The 'Q & A' section shows answers to common questions. And the 'Articles' section provides helpful articles about your water beds.